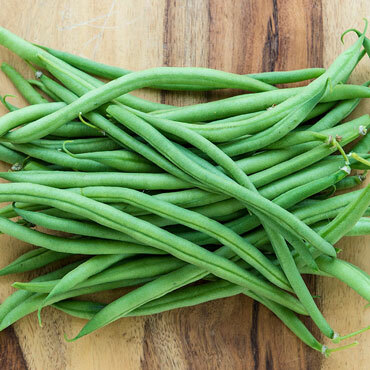 These bright green beans have 5.5" smooth, straight pods that are carried high on the plant for an easy harvest. Pick the beans often to encourage regrowth, since one planting will produce several crops. As an added bonus, they're stringless, and make delicious additions to your canning or freezing lineup! They'll keep their deep green color and flavor during processes. Alternatively, enjoy them fresh with your favorite veggie dip or sauteed as a side. Topcrop is high in antioxidants, and contains high levels of vitamins, K, A and C, meaning this veggie has anti-inflammatory properties. To boost each crop yield even further, try our Garden Nurture Soil Inoculant. Topcrop is resistant to Bean Mosaic Virus. 51 days to maturity. Days to Maturity: 51 days. Fruit: Round, medium green, stringless pods. Smooth and straight. Brown with buff mottled seeds. Soil Preference: Rich, well-drained soil, pH 6.0-6.8.